This dish tastes like you spent hours in the kitchen, but the truth is, it takes just minutes to prep and is ready to serve in 30 minutes or less! The secret? Roasting a few simple, yet delicious ingredients at high heat produces an intensely flavorful meal that tastes like it slow-cooked all day! Be sure to squeeze a couple of the roasted lemon wedges over the roasted chicken before serving for an extra burst of lemony-goodness! 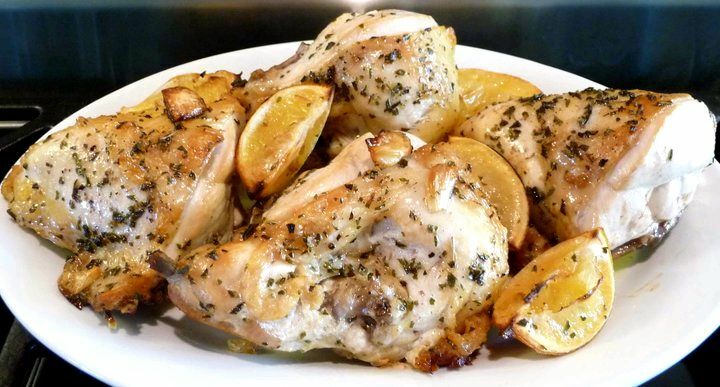 For a delicious variation of this recipe – Lemon-Thyme Roasted Chicken – simply substitute one teaspoon of dried thyme in place of the dried oregano. Then, follow the rest of the recipe as directed below. I love simple, yet scrumptious dinners like this one – just toss all of the ingredients together until well coated and bake! For easier clean-up, line your baking sheet with foil. Squeeze the juice from 3-4 of the lemon quarters to obtain one tablespoon of lemon juice. Place lemon juice into a small bowl along with the olive oil and oregano. Combine well. On a 12x17-inch rimmed baking sheet, place the chicken breasts skin side up and drizzle with the olive oil mixture. 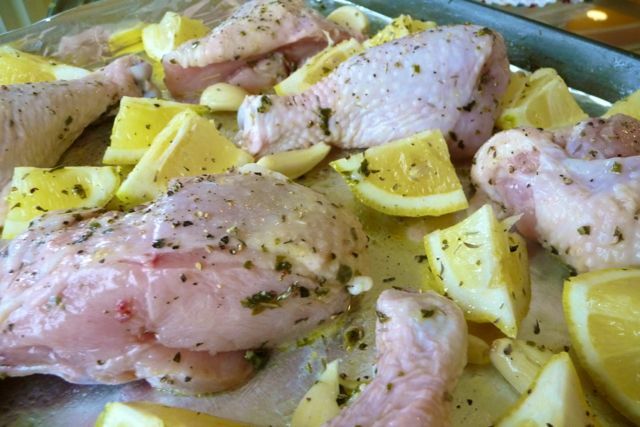 Then add the garlic cloves and lemons; toss all ingredients together until well coated with the olive oil mixture. Season with salt and pepper. Roast chicken, skin side up, until golden and cooked through, about 25-30 minutes. Recipe Variation: For a delicious Lemon-Thyme Roasted Chicken option, simply substitute one teaspoon of dried thyme in place of the dried oregano. Then, follow the rest of the recipe as directed. So simple and yet it sounds so yummy! This is my kind of recipe, thanks for sharing!!!! will the recipe work the same w/ boneless chicken breasts? or will I have to make some alterations? That was tasty! I wasn’t sure how to cut the bone in breasts in half without a cleaver (guess I need to go I’ve shopping! Oh darn 😉 ) but wanted to say it worked fine with them whole, I just added about 5-10 minutes. Loving these recipes, keep them coming! This was so good and easy! I will definitely make again. Thank you for sharing this recipe. I have a question about the olive oil. Is it safe to cook the olive oil at 450? Isn’t the smoke point for olive oil below that? Thanks! This is one of our favorite recipes! We make this at least once a week. The left over chicken has such great flavor, great for salads!